Carries oxygenated blood away from the heart via the aorta from the left ventricle towards the rest of the body. Brings back deoxygenated blood towards the heart. 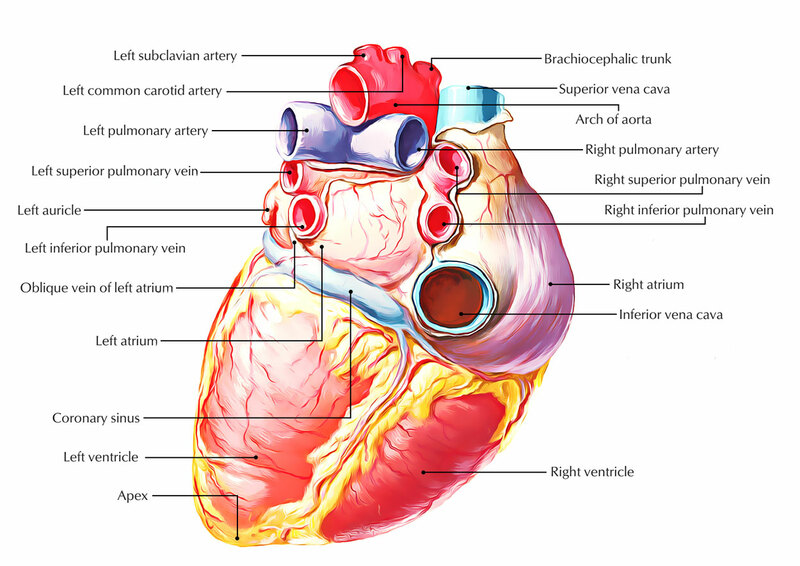 The systemic circuit, which contains about 84 percent of the total blood volume at any given movement, starts at the left ventricle and terminates at the right atrium. Coronary Arteries: Branches from the ascending aorta. They supply the heart. Brachiocephalic Artery: Circulates the head, neck as well as arms. Celiac Artery: supplies the abdominal area. Splenic Artery: supplies the spleen, stomach, and pancreas. Renal Arteries: supply the kidneys. Common Iliac Artery: supplies the legs and feet. Inside the capillaries – gaseous, nutrients, and waste exchange among blood and body tissues take place. Blood flows from arteries to smaller arterioles and inside the capillaries. This exchange takes place in vessels called sinusoids, in organs that don’t have capillaries like the spleen, liver, and bone marrow. The blood is carried to venules, to veins, to the superior or inferior vena cavae and back towards the heart after passing via the capillaries or sinusoids. Systemic circulation carries oxygenated blood from the heart towards the peripheral organs as well as tissue beds and returns deoxygenated or venous blood back towards the heart. The systemic circulation spreads out from the aorta towards the junction of the superior and inferior vena cavae at the plane of the right atrium. The elastic arteries act as high pressure outlets for oxygenated blood from the heart towards the periphery, both large and small. In order to contain the stroke volume and decrease the pulsatile blood flow into more continuous flow the aorta specifically acts as a hydraulic filter. The arteries split as they continue superficially until the arterioles are grasped. By distinctly changing their diameter, the arterioles act in order to control blood flow into the capillary beds. In the systemic circulation, they are the major location of hydraulic resistance. The capillaries facilitate the interchange of fluid and nutrients among the blood as well as the interstitial space. The venules are vessels that gather blood from the capillaries. These venules combine to create veins that bring blood back towards the heart.